Forge's traditional night latch can be installed for left- or right-handed operation. A simple snib button deadlocks the latch from the inside, providing added security. Its solid construction is the main reason it remains a popular product. The traditional night latch has stood the test of time. The Forge grip set will enhance your front door by giving it a unique signature. Each Forge latch has been designed to combine elegance with maximum security. We offer a varied range of finishes. The Schlage Keypad Deadbolt with Camelot Trim and Accent Lever in Aged Bronze is perfect for use on front doors, garage entry doors, and side and back doors. With a keypad deadbolt, you can control entry to your home more easily and securely. No more hiding keys under the doormat or losing track of copies just use access codes that can be created or deleted in seconds. The Camelot trim's scalloped architectural details make any room charming and approachable. Our Aged Bronze finish is inspired by traditional design, featuring warm, copper tones that break through its darker, aged exterior. Plus, it's been designed and tested with strength and durability in mind. 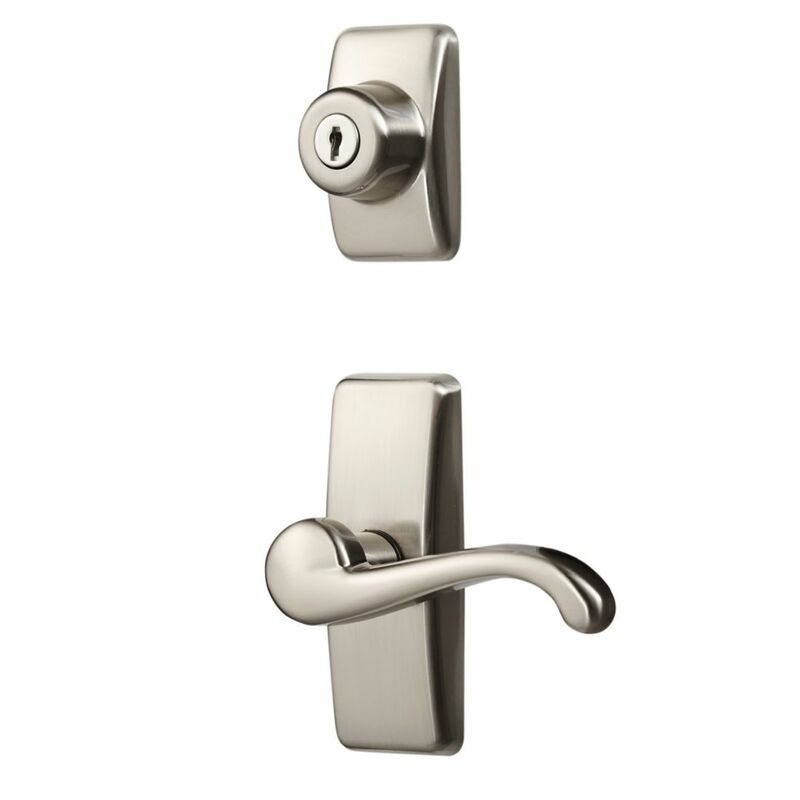 Deluxe Storm & Screen Door Lever Handle & Keyed Deadbolt is rated 4.8 out of 5 by 24. Rated 3 out of 5 by Madelyn from The first box had missing parts so I had to... The first box had missing parts so I had to return and order a second which contained all of the parts. My handyman installed the set for me. Rated 5 out of 5 by godfrey from It installed easily since I was replacing an old fixture just like it. This new one has a better... It installed easily since I was replacing an old fixture just like it. This new one has a better fit and finish. The improvement is very noticeable from both the inside and outside. It would be harder to install if you had to drill the holes in the storm door, which I didn't have to do. Rated 5 out of 5 by HomeDepotCustomer from I ended up using plumber putty to hold in the... I ended up using plumber putty to hold in the bar between the two deadbolt pieces after I lost the first one down in the door. I bought 2 of these sets and am very pleased with the quality. Rated 5 out of 5 by Steve from I bought this set after being unable to find a... I bought this set after being unable to find a direct replacement for an EMCO Forever storm door. This fits the existing holes in the door. Good quality and feels solid. Mechanism works smoothly. My only complaint is the back of the outside handle is hollow and is uncomfortable when pulling on it.